This page covers the important parameters related to mass for rockets launched from balloon or from aircraft. The goal is to minimize the cost of the vehicle and its carrier aircraft. Minimizing the mass is generally the good way to design a rocket, although it may increase the cost when some parameters are changed, like the rocket's thrust. A trade-off has to be made as explained on this page. Information about particular systems of existing rocket engines can be found in the rocket engines page. The two first sections about Delta V, combined with the famous rocket equation, serve as basis to evaluate the mass ratio of the rocket. Combined with a first evaluation of the mass of each rocket system, a computer model for rocket mass has been made. 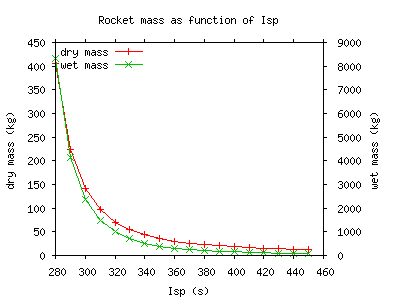 The effect of the variation of single parameter on the wet and dry mass of a rocket has been documented as graphs using this model. The gravity drag is a particular parameter affected by other parameters and its variation has dramatic consequences on the mass of the vehicle. It is studied more deeply at the bottom of the page. The final velocity of the rocket will probably be the same than the required satellite velocity, unless we decide to catapult it somehow. This is the main part of the delta V. At an altitude of 200km, the orbital speed is 7.8 km/s for a circular orbit, and it doesn't change much for an altitude ±100km. We might add some spare speed because if we do only one burn the orbit will not be circular and the delta V will need to be higher. Re-igniting the engine would be required for orbit circularization, but with an SSTO the engine provides so much acceleration on its final seconds that it would require to be very accurate with the burn time. Moreover, the shut-down and ignition procedures introduce losses in propellant mass, which is something we want to avoid. Atmospheric drag should be very low at this altitude, although it scales badly with small vehicles as explained at many places, in particular in this paper . The paper also models the delta V losses and states that the difference between ground launch and a subsonic 40'000 ft (12km) launch is 1.5km/s, for a 77kg/20cm diameter vehicle, which is huge! (see page 46). It still has to be calculated in our conditions. If we need to pitch up hardly after rocket release this drag will increase in the beginning of the flight but will quickly reach negligible values. Gravity drag is about 1100m/s to 1500m/s for a ground-launch. It is tightly related to the time spent accelerating to the orbital speed, and in fact the only factor if aerodynamic lift is ignored. The longer the vehicle is accelerating, the longer it has to accelerate against gravity, in other words, compensate the gravity acceleration with a 1g vertical acceleration and accelerate vertically to climb above the atmosphere. On the end of the acceleration, when the vehicle reaches an horizontal speed close to the orbital speed, the centrifugal acceleration starts to compensate the gravity. The overall thrust-to-weight ratio is the vehicle's parameter that affects the time spent burning. It is the thrust-to-weight ratio of the fully loaded vehicle. A ratio of 1 means that the vehicle stands still, if it's vertical. To avoid atmospheric drag losses and minimize gravity drag losses, and from what we could find in the literature , a ratio of 2.0 is common for small vehicles. Another source states the opposite, that since we're not launching in vertical direction, we don't need as much ratio, and 1.25 is enough. As said above, a larger value implies less loss in gravity drag, so we should opt for a more powerful engine. The issue is then to know which is worse between heavier engine and slower acceleration. This is discussed in the graphs at the bottom. For an aircraft rocket launch, the release velocity will be close to the aircraft's, probably with a pitch of zero (horizontal). The rocket will start falling as soon as it is released. For the rocket engine to compensate this gravity drag, it must be powerful enough and vectored aggressively, for example an overall thrust-to-weight ratio of 1.75 with an thrust pitch of 35 degrees or a ratio of 1.42 with a pitch of 45 deg. Such a high pitch is practically non-realistic as the vehicle is moving forward at the aircraft speed, because it would apply very large stress on the vehicle. Moreover, this just compensates gravity, it's not enough to actually climb. The vehicle would reach Mach 3 before gaining 2km of altitude, which is counter productive in terms of aerodynamic drag (not taken into account in these simulations). This graph depicts the rate of climb for an even more powerful engine and a pitch of 45 degrees. Even if the thrust pitch is 45 deg, the real pitch given by the vehicle's velocity is very slowly going up due to the initial horizontal velocity. The trajectory is very unusual compared to ground- or balloon-launched rockets which start by gaining altitude before horizontal speed. These simple examples show how important it is to use the atmosphere to climb, in the case of an aircraft launched rocket. Lift has to be generated to force the vehicle to pitch up quickly and gravity should be partly compensated by lift too, allowing a less aggressive thrust vector to be used and increasing the gained altitude in the lower rocket flight atmosphere. The atmospheric drag will increase, and this drawback should be evaluated. In the case of Orbital's Pegasus system, it is said here that its delta V reduced by approximately 750m/s with the aircraft cruise launch (40'000 feet, 500mph). It uses small wings to help the pitch-up and the climbing, its overall thrust-to-weight ratio is between 2 and 3 and it has 3 stages. 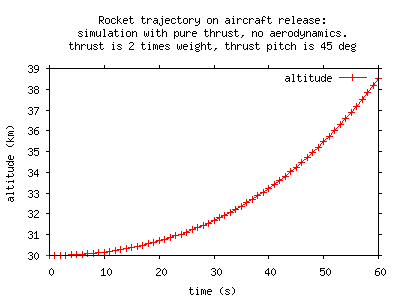 From our estimations, assuming no aerodynamic drag or lift, the gravity drag is around 1400m/s when the overall thrust-to-weight ratio is 2.0, and drops below 900 when the ratio is 3.0.
altitude, the higher it is, the less atmospheric drag and climbing before actually start the useful horizontal delta V. The planned release altitude is 30km ±5km, so that leaves at least 100km to climb, probably even 160km if we want to be able to do 9 orbits, because of atmospheric drag on upper atmosphere for such a small satellite. high-altitude flight strategy, a choice that has to be made between subsonic flight with large wingspan and reduced thrust or supersonic flight with high power engines. Choice 1 (subsonic) has a planned horizontal release velocity of 270m/s ±20m/s (0.9M) and a quite small, 5° ± 5° vertical release velocity. Choice 2 (supersonic) has a planned release velocity still unknown, possibly 1.5M ±0.3M but has the advantage of giving a higher release altitude and vertical velocity component, likely consistent with the rocket flight path initial vector. The aircraft is even more problematic with this choice. latitude, important for ground launches, the latitude determines the speed given by Earth's rotation. We have to keep in mind that the aircraft velocity is generally the airspeed, and that the atmosphere is moving to the same average angular speed as the ground. We don't know where we will be able to launch it yet, so let's take a conservative value for now, 300m/s. At equator, it is 465m/s. The fact that's an aircraft or a balloon doesn't really change the value because they don't have an infinite range. Once we have a realistic estimation of the required delta V for our rocket, we can start thinking about the characteristics of the rocket by itself and of its engine. The simplified rocket equation is expressed as http://lcas.otaski.org/images/formulas_mirror/rocket_equation_neg.png, where m0 is the initial total mass including propellant (rocket's wet mass), m1 is the final total mass (rocket's dry mass), and ve is the effective exhaust velocity. This simplification is only valid for: no gravity nor aerodynamic drag, constant exhaust velocity (or Isp), ideal nozzle expansion (pe = p0), and with an initial null velocity . The calculations and model described below have been done with this simplified equation, yet it is incorrect since in vacuum we have no ideal nozzle expansion and the initial velocity is not null for aircraft-launched rockets. The effect of these two parameters have to be evaluated soon. Below is a list of important parameters for this equation or for the rocket itself, and how they relate to the delta V.
The exhaust velocity of rocket engine's produced gas is closely related to the Isp of the engine: http://lcas.otaski.org/images/formulas_mirror/exhaust_velocity_neg.png . For the duet LOX/E85 we chose, max Isp should be between the max Isp of RP-1 (353s) and max Isp of 92.5% alcohol (338s), so around 344 ± 6s. Isp is very important and we should aim and actual Isp approaching 10s from the max Isp. Max Isp is vacuum Isp with the most efficient rocket engine and high-expansion nozzle, the sea level Isp is generally around 10% less, and since we will use a cheap design we may not near the optimal efficiency. 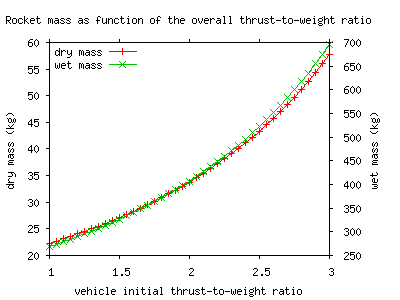 Thrust is related to this exhaust velocity in the following way: http://lcas.otaski.org/images/formulas_mirror/thrust_neg.png . The dotted m is the mass flow rate of the engine, i.e. how much propellant is burned every second, and the second part can be ignored for approximations. In vacuum, as the external pressure p0 gets to 0, the larger the nozzle discharge area is, the higher the thrust, but this has a mass . 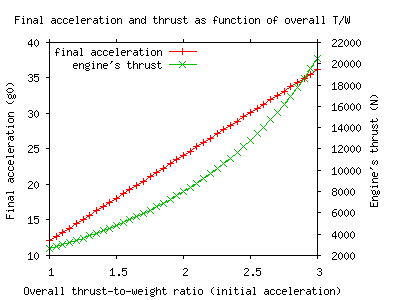 Thrust is not directly related to the delta V, but it is related to the mass of the payload that has to be accelerated. For example, ion engines provide very high Isp and exhaust velocity but their mass flow rate is very low, so is thrust. Therefore, they cannot be used to launch something from Earth to space. The dry mass of the rocket, once the propellants have been chosen and Isp evaluated, it's the most important factor. 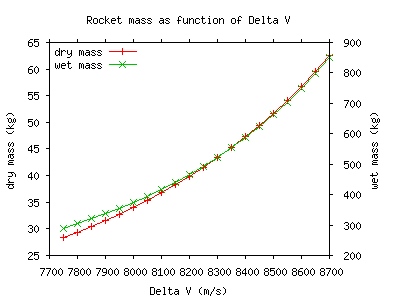 The mass ratio (wet mass / dry mass) has a strong influence on the delta V capability. Conversely, since the mass ratio is fixed by the rocket equation, the lighter the rocket and the more efficient the engine is, the many times less fuel will be required and the smaller the rocket. To make a light rocket, high quality materials, thus expensive, should be used. This is studied in the next section. For the N-prize, the payload mass is nearly insignificant compared to the rocket mass, which is good for the delta V.
The mass of the engine itself is closely related to the type fuel delivery system used (what kind of pump or tank pressurization) and to the thrust it produces. The thrust-to-weight ratio depends mostly on chamber pressure, which depends on the capabilities of the fuel pumps system and the efficiency of the regenerative cooling of the chamber and nozzle. Also studied below. As an example, if the delta V is 9.0km/s, and that we have a 340s Isp, the required mass ratio of propellant is 1-e^(-9.0/3.3) = 93.4%, which is very hard to achieve. SpaceX has done it better than 95% (see spacefellowship forum thread on SSTO) for a first stage, so it doesn't include the payload, fairing, and so on. The Haas 2c rocket from ARCA (Romania) is also very lightweight and aims to be an SSTO demonstrator. Their engine has a very nice 110:1 thrust-to-mass ratio, the rocket having a 96.9% mass of fuel. With a 8.0km/s delta V, assuming we have a higher release velocity, the same rocket engine and still only one rocket stage, it becomes 91.1%, still quite hard. A two stage rocket can do this, see the examples in the rocket equation Wikipedia page, but if we need to build two rocket engines' systems, we can be sure that we will exceed the money requirement. So the main question becomes: on what subsystems can we found cheap alternatives to decrease the mass of the rocket? 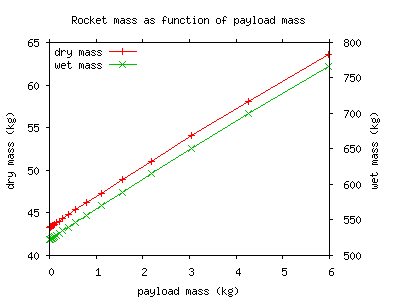 The mass ratio evaluated above does not tell us what mass we should expect from the rocket. It depends on the minimum mass all systems can be integrated: engine, tanks, structure, avionics, communications and other controls. Again, the paper  addresses this subject. Since we will have to design our own rocket engine to meet the cost requirement, we can design an engine for any thrust. Sizing the engine is an iterative process: a more powerful or heavier engine will require a much more heavier rocket to achieve orbit because of the mass ratio, but an even more powerful engine is required to propel this new mass and so on. A parameter that we should estimate in the first place is the thrust-to-weight ratio for the engine, which depends on choices made for the engine design. For example the thickness and material of the engine's wall are linked to the cooling method, material price and manufacturing capability; mass of accessories like pumps and pipes are linked to the pumping method. Once the rest of the rocket's mass has been evaluated, the iterations can be made to have a possible engine mass and final vehicle mass. The thrust-to-weight ratio for the engine doesn't scale linearly either, but in our advantage here . A ratio of more than 100 is common in small launchers' engines , for example 110 for the ARCA Executor engine (ablative cooling, pressure-fed). To minimize cost, we probably will use a conventional pumping system (not turbo-machinery) instead of a tank pressurization system to force the propellants to the engine. This adds weight to the engine (the pump), but removes mass to the tanks and accessories. Our engine's thrust-to-weight ratio will probably be lower than 100. Fuel tanks' mass depends on the type of fuel delivery system used: by tank pressurization or by pumping. When using pressurized tanks to force the fuel into the engine(s), the tanks must have thicker walls to sustain the pressure. When pumping fuel, the tank simply has to prevent it from leaking into vacuum. For kerosene-like fuel, it can be very simple, a plastic tank like in cars. For the cryogenic oxidizer (LOX), it's more complicated due to metal weakening with large temperature differential and to the evaporation losses related to poor insulation, and may require pressurization anyway. Tanks are the largest part of rockets, they may be used as a structural part too. That requires tanks to be strong enough to overcome the structural stresses on the vehicle. Given the budget, material for the structure and tanks will be aluminium, not titanium and probably not composite materials either. Stainless steel is another possibility but around 3 times more heavy than aluminium. If tanks are strong enough, they can be used as part of the structure of the rocket. If they are not, and between them in any case, an external skeleton has to be build that will undergo mechanical forces that apply to the vehicle. The max Q, maximum dynamic pressure that the vehicle has to withstand, is reduced when launching from altitude than from ground, so the structure may slightly get lighter. Bending stress is also important as rockets turn or undergo shear winds. Even if we launch from a high altitude, the vehicle should be as aerodynamic as possible. The fairing and the rocket's body must be pretty smooth. If we actually use the tanks as structural components, we may not need an extra outer layer of metal that wraps around the entire rocket, a skirt between them will be enough. The fairing requires a jettison mechanism, the equipment bay requires structure too. Avionics, including sensors, but excluding actuators and wiring, is a fixed-mass package. Contrary to tanks or structure, it doesn't change when building the more powerful or larger vehicle. estimated in 1999 that avionics could fit in 50g and 220g for batteries, but it used differential thrust throttling on several engines instead of gimbals or RCS. We will probably have only one engine, and attitude control actuators are mandatory for the rocket's first stage at least. Recent rockets, like ESA's Vega and SpaceX Falcon-1's second stage's use electromechanical, or electromagnetic, actuators. They replace the usual hydraulic actuators (jacks) that require pressurized hydraulic fluid and all their accessories: pumps, tanks, valves and so on. Batteries would have to be upgraded for this use, but off-the-shelf servomotors may be up to this function. Other parts of avionics include the main computing board, the sensors and the wiring/connectors. The computing board can be very small and light-weight but all connectors will take more space and with the wiring will probably be heavier. Sensors mass approximation can be made using readily available components, see the sensors page. Engine's gimbal or RCS, valves, pressurization system (should count as engine mass), communication (should count as avionics), fairing, orbit insertion mechanism, and so on. A program has been created to make the iterations explained above. The C code, features and version information are available here: File:Rocket mass.c. An initial dry mass has to be set arbitrarily, the closer it is from the final value, the less iterations are required to converge to it, so it's not really important. The same iteration can be done on wet mass instead of dry mass, the result is the same. This approximation has been done with the program in version 3. The input values, delta V of 8.3km/s and T/W ratio of 2.5 are the result of the analysis of the rocket flight with no atmosphere effect on it (drag or lift). We are working on an aerodynamic analysis that may give more realistic values. There are also the values used for the graphs below. The frost created by cryogenic fluids is not taken into account. The telemetry equipment has not been seriously evaluated yet. The variation of one parameter is represented in the graphs below, demonstrating the way they affect vehicle's dry and wet mass. Take care about the different scales of the dry (red) and wet (green) curves. Rocket parameters are the same as above: 12.05 mass ratio (8.3km/s Delta V, 340s constant Isp), 2.5 T/W ratio, propellants are LOX and E85 at stoichiometric ratio, including 1.25kg of LOX evaporated and tank insulation, full aluminium structure, composite skirts. The software used was version 3 (see updates here: File:Rocket mass.c). Graphs are valid only for one parameter change with the others fixed as above. 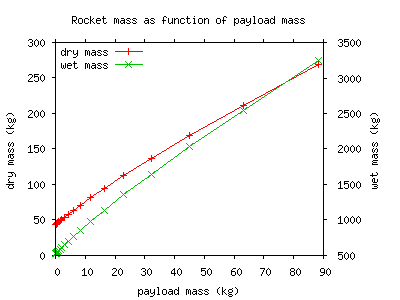 These two graphs represent the effect of the payload mass to the final mass of the rocket. They use the same data, but the second graph is zoomed-in for very small payloads. There is a slight non-linearity of the vehicle dry and wet mass curves. These graphs also apply to any fixed-mass subsystem, like the avionics or sensors. We can see that for small mass ranges, adding 1kg to the vehicle will approximately increase its dry mass of 3.5kg and its wet mass of 45kg (remember that's only valid with the input parameters as above). We see above the dramatic effects of delta V increase and Isp decrease on the rocket mass. A mere 200m/s delta V increase can add 200kg to the wet mass of the rocket, and a too low Isp makes it simply unrealistic to reach orbit. For an SSTO vehicle, we should try to avoid an Isp below 340s. 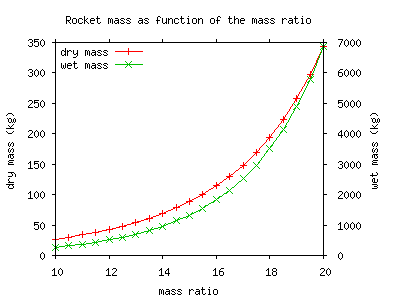 The first graph below represents the vehicle mass evolution as function of the mass ratio (wet mass / dry mass). This ratio is given by the Isp and the required Delta V. The result is consistent with what is explained in the mass ratio Wikipedia's page. 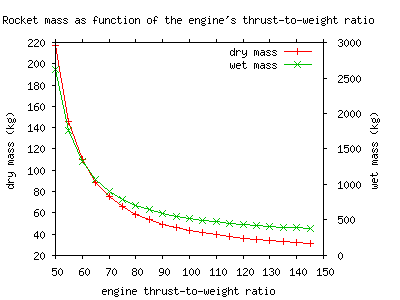 The second graph highlights the importance of the engine's thrust-to-weight ratio, fixed by engine's design and the need for high thrust to reduce gravity drag. 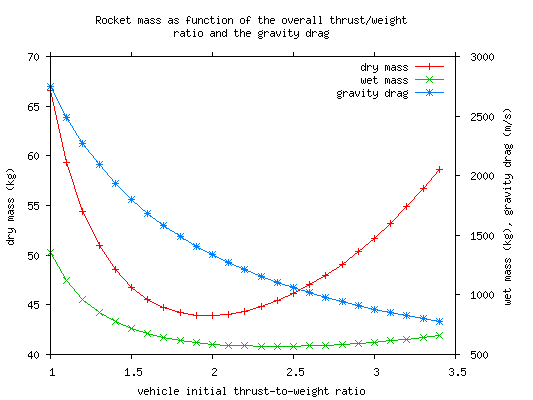 The first graph here depicts the effect of initial acceleration (overall thrust-to-weight ratio) on the vehicle's mass. It related to the gravity drag, the aerodynamic lift, the rocket's trajectory and release velocity, and thus hard to evaluate properly. A higher overall thrust-to-weight ratio gives a more important initial impulse (the acceleration at ignition) and a lower gravity drag, but a heavier engine. In our air-to-orbit scenarios, fortunately, we may benefit from the aircraft release speed and some lift, and the ratio may be as low as 1.25. To be studied. A possible issue with SSTO vehicles is the final acceleration. Since the engine is sized to propel the fully loaded vehicle and thus a mass much larger than the payload's, when the propellants have been consumed and the fairing jettisoned, the thrust-to-weight ratio is very important. The second graph above shows that even for a small initial acceleration, the final acceleration, if no throttling is implemented, easily reaches 20 or 30 G's. We can see on the graph that the final acceleration varies linearly with initial acceleration, while the engine's thrust required to do so is at best quadratic. The question was: is it better to have a more powerful and heavier engine that minimizes the gravity drag because the burn time is decreased or to have a lightweight engine burning longer? An issue with this question is the term better. It was first thought as the vehicle with the lowest mass and in this case the answer is in the graph below: it's a compromise. However, when cost is considered, a less powerful engine costs less to manufacture and to design, and it should be evaluated how much more fuel can be taken to compensate this smaller engine without increasing the overall cost. That's a complicated question too. This discussion confirms the fact that a 1.25 T/W ratio is better costwise. This graph combines two changing parameters: the overall T/W ratio and the gravity drag that it implies. Changing the gravity drag changes the required delta V, thus changing the mass ratio, that's why the curves have a different minimum. The concerning parameter here is the wet mass, used to design the carrier aircraft. The gravity drag is pretty high compared to what was expected, between 1000 and 1300 m/s in the minimum mass zone (with Isp = 340s). Consequently, we see that the rocket's mass doesn't go below 550 kg. Incidentally, the wet mass doesn't evolve much for T/W ratios between 1.8 and 3.2, and designing a smaller engine because of the cost would not have much bad consequences on the rest of the vehicle. Fixing the overall T/W ratio to 2.5 in our model gives the following rocket: 569.8 kg on the ground, 46.1 kg dry, an engine's thrust of 13.93 kN. Other parameters are above. A two-stage rocket should be considered to lower the mass and size of the rocket (3.53 x 0.47 m tanks here) to something more feasible. Some questions follow: is the engine's T/W ratio constant over the thrust range? How does the structure needs to evolve to cope with the stress of the increasing thrust? How is that correct when considering aerodynamics (drag and lift)? How does the minimum moves when the Isp changes? This page was last modified on 29 December 2012, at 03:08.